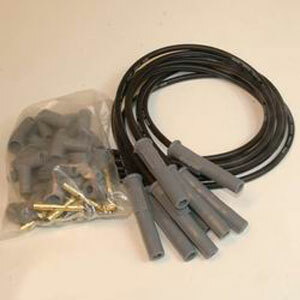 The ultimate spark plug wire is now available in black! MSD Super Conductor spark plug wires transfer spark energy with the lowest loss possible while generating the least amount of radio frequency (RF) interference. They combine a much thicker copper alloy center conductor, helically-wrapped around a ferro-magnetically impregnated center core. This assembly not only lowers resistance to about 40-50 ohms per foot, but provides radio interference suppression equal to that of conventional wire with around 1,500 ohms per foot of resistance. Surrounding this high tech core is a special compound that combines silicone and synthetic materials to provide the excellent heat resistance of silicone with the strength and chemical resistance of synthetic materials.